GBP is being supported by the growth of the 10-year government bonds yield. GBPUSD is massively under the influence of the parliamentary hearings on inflation in the UK. GBPUSD has been moving in neutral zone and yesterday it rose to 1.46400 but today it fell and is moving in lower ranges. This fall can be regarded as a short term pullback creating a buy opportunity. 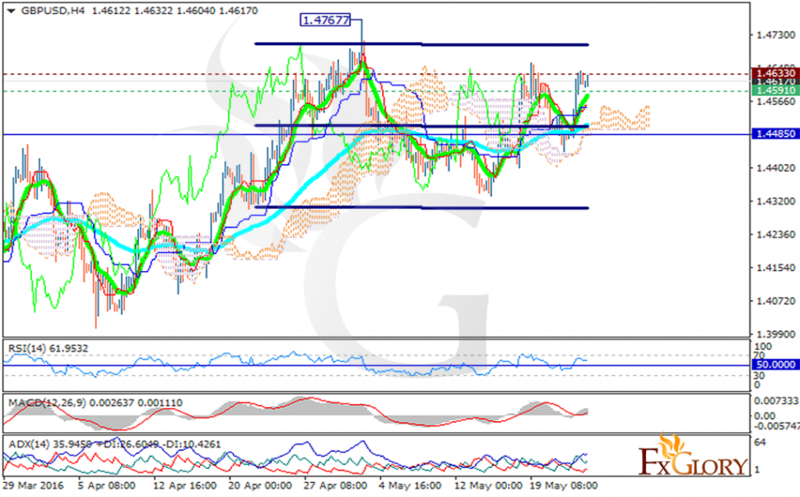 The support rests at 1.45910 with the resistance at 1.46330 which both lines are above the weekly pivot point at 1.4485. The EMA of 10 has surpassed the EMA 75. All indicators are showing price growth for now. The price is above the Ichimoku Cloud and the Chinkou Span. The Tenkan-sen is showing a horizontal movement while the Kijun-sen is showing an upward movement. The MACD indicator is in positive territory, the RSI is above 50 level and the ADX is showing strong buyers. Long positions are recommended with the target at 1.4760.